Skydancer Dancing Inflatables are used for Advertising, Sales, Location Awareness, Product Promotion, Grand Openings, Sporting Events, Parades, Celebrations, Trade Shows, Car Lots and Conventions. Sized Small to Extra Large with Simple Setup; Air Dancers are suitable for Indoor or Outdoor Events. Add an internal light system for Night FX on selected models. We can produce custom Characters, Product and Mascot Replicas. Lettering and four color digital logo reproduction available. Contact us for a FREE Quote. Do not accept less than the best. We are Factory Distributors for SkyDancers Intl. the Creators of Skydancer Active Motion Dancing Inflatables. SkyDancers are the #1 choice of marketing professionals and retailers. 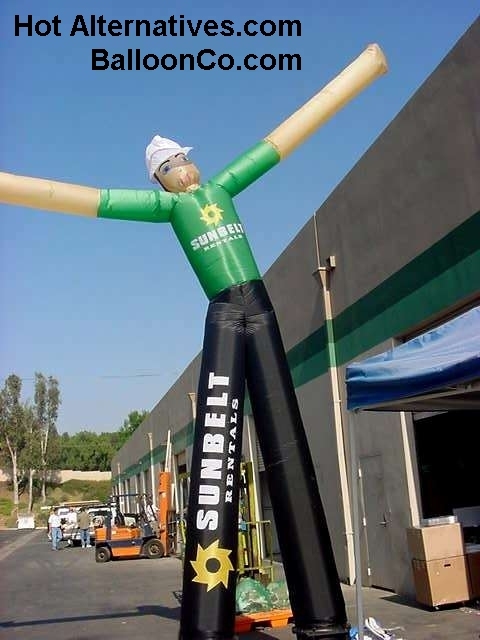 The only dancing inflatable with the performance needed for frequent/extended use. Factory Warranty. BalloonCo is an Authorized SkyDancer National Distributor Established 1991.